Recorded in the Micro Chambers I & II, Wales. Mastered at Metarc. The Healy Brothers continue their legacy with the seemingly endless supply of material, this time on the newly formed American label, Component Records. Accidental Happiness is an 8 track e.p. containing 6 new “songs” and 2 remixes by Codec and Dryft (respectively). Although I felt SR’s last full length ‘Augmented Lines’ on Hymen Records showed promise, this uninspiring, bland e.p. caused me think otherwise. While there are some interesting sounds and patterns presented here, they are few and far between, instead coming off as pointless and just plain annoying. A possible exception to this is the fourth track ‘Tix’, laying down some heavy, broken beats, controlled distortion, and rapidly spurting bleeps. The spastic ‘msbt’ contains screeching percussion cut with spitting clamor and interesting sound effects but again having no real direction or cohesiveness. 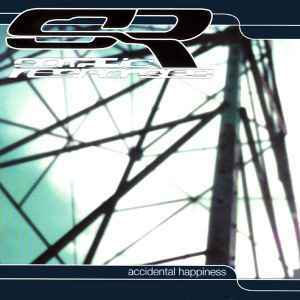 The Codec mix of ‘Accidental Happiness’ gives the title track an urgent, industrial work-over, sounding very disoriented and slightly dated, which can be expected based on the act’s previous efforts for Component. About the only enjoyable 3 minutes and 35 seconds of this release is the Dryft remix of the title track, completely refining the original elements of the song and transforming them into a wonderfully dark atmospheric tune with a steady pattern of static-tinged beats, mellow tones, and lovely synthwork. This remix is a beautiful and introspective piece of work as we’ve come to expect from this superb Gridlock side project. There are only 2 reasons I can think of to buy ‘Accidental Happiness’: 1. if you’re a persistent SR fan, in which case you probably have this already, or 2. for the short but sweet Dryft remix, but only if you’re willing to drop 10 bones for 3 ½ minutes of rewarding music. This e.p. is a shoddy and somewhat unbecoming effort for this English duo, who have proven their talents more effectively with their contributions for Hymen Records, but have again fallen short with other labels like this name-dropper for Component Records.